Apparently hidden for decades was an awful truth surrounding the making of Frosty the Snowman. Yes, it is truly a beloved program with a character that every child and child-at-heart holds dear, but the one who coined the phrase “Happy Birthday” when coming to life, ruined a co-star’s life in the process. Christmas is just around the corner, and Rankin & Bass producers have announced an exclusive, platinum, special edition, 3D and HD, unlocked DVD release of Frosty the Snowman. This announcement comes to you exclusively from Army of Awesome People. Rankin &Bass decided to share a story of foolhardy actions that took place so many years ago. The new DVD release offers a look into the tragic story of Karen, the little blonde girl who was determined to get Frosty to the North Pole to avoid melting. Along the way Frosty made decisions, which many would consider irresponsible, such as leading a parade with children through the town square in a rush of traffic, and encouraging Karen (who was only wearing shorts, no pants) to join him in a refrigerated train car to the North Pole. These pale in comparison to a decision Frosty made that Frosty, Karen, and the entire show staff would not soon forget. The DVD exclusive extra highlights this decision when Frosty and Santa took Karen home from the poinsettia greenhouse in the woodland meadow. When they took Karen home, instead of dropping her off on the street by the door, Frosty thought it would be fun to leave Karen on the roof of her home, which was ice and snow covered. 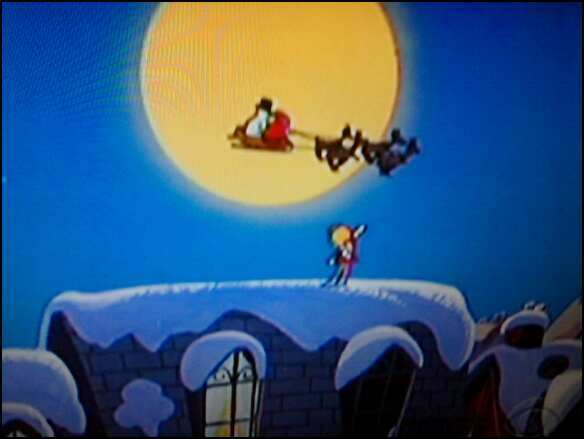 As Frosty and Santa bid Karen farewell and flew away to the North Pole, Karen was suddenly alone, still cold, and confronted with the task of getting down from her treacherous roof. What happened next was so tragic it was kept secret since filming the show’s ending sequence. Karen began her decent from the roof and in the process stepped on a crack, fell and broke her back. This explains why subsequent Frosty programs have never included the sweet little Karen, who held such promising talent in the showbiz industry. Karen now resides on a beach in Belize… far, far, far away from snowy locales. One can often see her attempting to create a Sandy the Sandman on the beach out of her neurotic psychosis reliving her brief Hollywood career filled with a living snowman who ruined her life. Here at Army of Awesome People, we were fortunate enough to be provided with an exclusive clip of the DVDs bonus footage. This piece of video shows Karen’s contempt toward Frosty. « Next week on Army of Awesome People….